Financial freedom is not rocket science. There’s no magic to it nor do you have to be special to experience it. 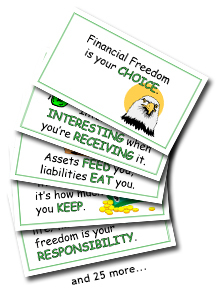 You create financial freedom by learning the basic principles all financially free people use to get that way. Financially free people have money management habits that got them where they are and keep them there. • Put your money to work for you. • Only borrow money if it’s going to make you money. • If you can’t afford it in cash, you can’t afford it at all. What habits are YOU willing to develop in order to experience financial freedom soon?